One minute messed up my photo! As I stopped my car at my yard gate on my way to work, I saw a jet trail criss crossing through the moon. I pulled the car through the gate, and then got my phone out of my purse to take a picture. 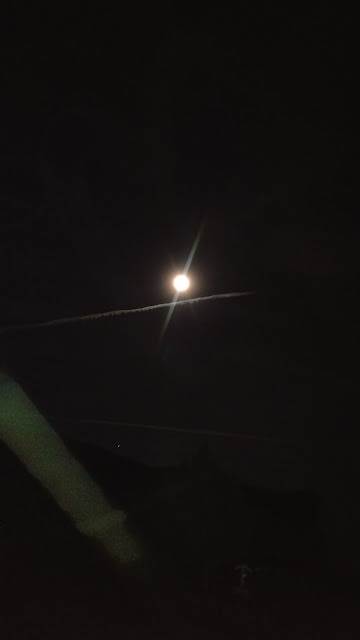 The contrail was no longer cutting through the moon, and it was less than a minute later! Nature waits for no man... or woman. Do you take pictures when the opportunity arises? Or do you wait for "later?" After I posted my Easter Dog blog with the epic photo of Bibs nose to nose with the Easter Bunny, I was inspired by a PuppySpot graphic to blog even MORE about not only Bibs, but other doggies we've owned and loved. 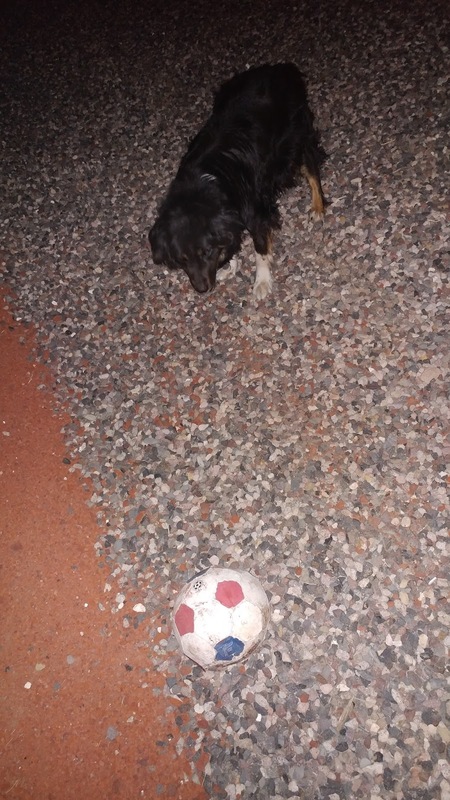 As you might surmise from this new photo of Bibs, one of her favorite games is ball. She will chase launched tennis balls (thrown or kicked) or old, deflated balls of any sports type. (Inflated large balls are of little interest, since they are too round to bite onto and carry to whomever she hopes is a ball-launcher person.) Bibs is very willing to provide hours of fun, healthy exercise for her and her human playmate. Having dogs has definitely benefitted our whole family. My husband once had a Springer Spaniel named Trixie that he swears could read his mind on their hunting trips, a hobby that provided him with plenty of outdoor exercise and good heart health. She was a one-man dog, but would interact with the rest of the family, especially if my husband wasn't there. When she had puppies, our young sons enjoyed making sure that they got lots of love and human interaction. They also wanted to keep all four puppies. You can check out PuppySpot if you’re considering adding a fancy furry friend to your family. After Trixie, we found a puppy named Griz from a classified ad. He started out as big as a cat, then grew to the size of a Newfoundland. Griz passed on at 11 years old, a week after we had a new baby. After moving to a different house, our younger boys wanted a dog, but my husband said he thought we should be done with dogs. I said it wasn't the younger boys' faults that they were born after our earlier dog years, and they should be able to grow up with the benefits of having a dog like our older boys. My husband finally asked if I would be ultimately responsible for a new dog. Jumping up and down, I said, "YES!" and Bibs came into our lives. At 13, she our longest lived puppy dog. When our boys were sad or upset, they would often go outside, and I'd check on them through the window. More often than not, they had their arms wrapped around a dog, telling it their troubles. While we have been fortunate enough to have good health, not needing doggie alerts for seizures or anything, Griz protected me a couple of times from questionable characters. Lunging, he barked like a maniac. I managed to hold him back with his leash, but they certainly didn't try anything shady with Griz at my side. While it seemed to take our sons longer to get puppies, as of last month, three of my sons have finally adopted them "for their children." Yet when I visit, I see my great big boys holding those dogs, talking to them, petting them and deriving comfort from those furry friends in much the same way as when they were little, proving that you're never too old to benefit from the unconditional love of a dog. What kind of dog do you like best? Do you have a dog now? Did you have one as a child? 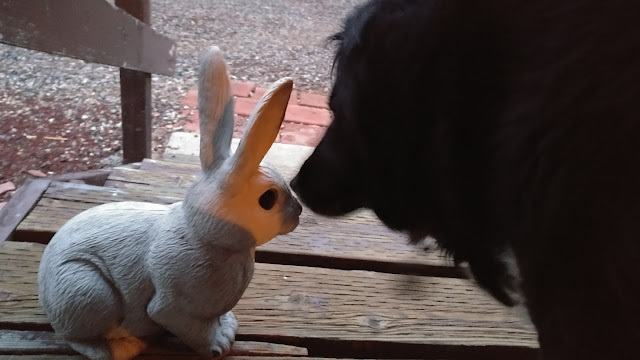 When I introduced my dog to the "Easter" bunny, she (the dog, Bibs) was rather interested. When she found out eggs were involved, she was rather excited! Of course, if we ever had Bibs as the Easter Dog, there would likely be no eggs for anyone else, because she likes them so much! This is "Belt," a stuffed animal with long, Velcro tipped arms that wrap around my backpack strap and stick together, letting him travel with me as a warm, soft, uncomplaining companion. 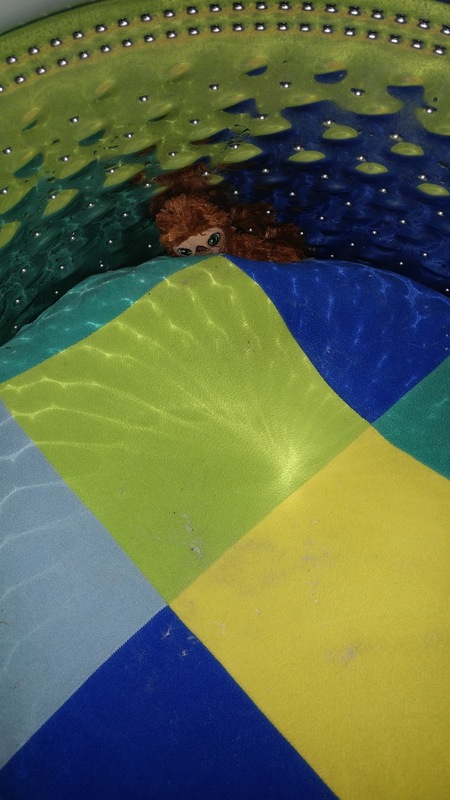 Traveling can make one dusty and sticky, so he went for a swim in the washing machine. Funnily enough, when I opened the machine, Belt wasn't buried under the blanket that spread out over all the other wet, clean wash. Belt had his head up, checking out the inner workings of the washer. I know it's just a stuffed toy, but I couldn't help but project human emotions of curiosity and taking control of a situation onto the fuzzy little toy. Have you ever gotten inspiration from an inanimate object?